Cochenille Design Studio’s pattern making software. It is used for on both Windows and Macintosh computers. 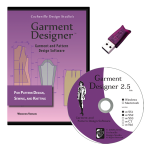 Garment Designer 2.5 uses a USB Hasp key (dongle). You may install the software on your desktop and your portable. The key must be plugged in to operate the software. This is the same key system we use with Stitch Painter Gold 3. Those who own Stitch Painter Gold 3 may choose to update your existing key. This will allow you to use one key for both programs.